THE MARK OF ZORRO, 1940. Original Half Sheet (22” x 28” / 72 x 92 cm) originally folded, now paper backed movie poster starring Tyrone Power, Linda Darnell, and Basil Rathbone. Directed by Rouben Mamoulian and produced by Raymond Griffith. “Who was this bold masked adventurer whose mocking laughter left terror in every heart- but one?” A sound remake of the 1920 smash hit silent film, the story follows a wealthy young aristocrat who adopts the guise of a masked outlaw “El Zorro” who vows to be defend the common people, and restore justice to the land. 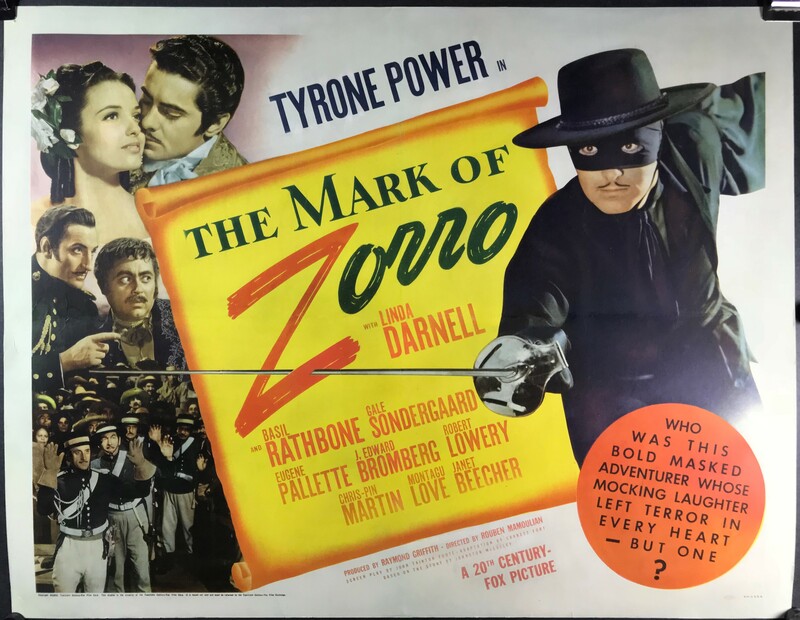 The Mark of Zorro was nominated for an Academy Award for Best Original Score, and in 2009 the Library of Congress named the film to the National Film Registry to be preserved for all time. This poster is in excellent C9 condition with very bright colors and no damage or stains, the fold lines were expertly retouched during bacin. The pinholes in each corner are also still faintly visible.